Well once again VeggieTales has done it!! They have released another great DVD that my family loves! 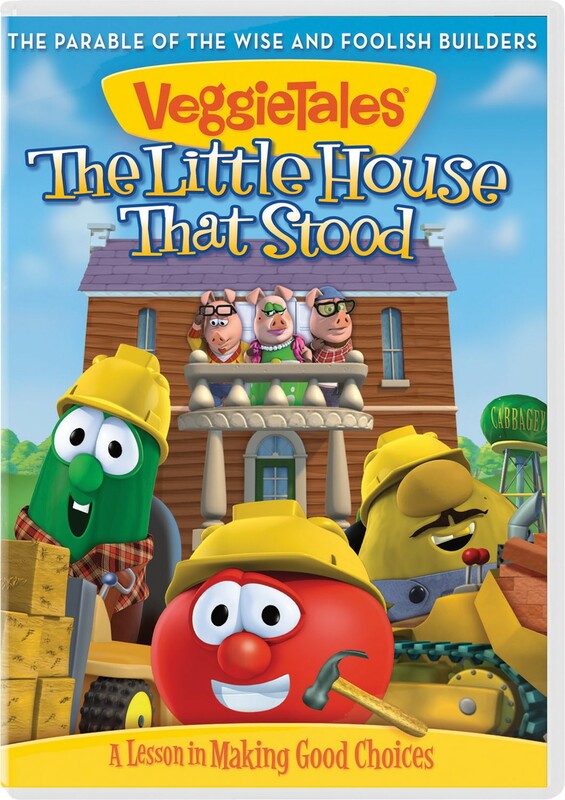 This time VeggieTales put their veggie swing of things onto the classic children's stories of Humpty Dumpty and The Three Little Pigs. Teaching our children to make their own choices helps to create an opportunity for them to learn to be independent and accountable. VeggieTales helps our children get a solid start and learn lessons they will carry with them throughout their lives. The Little House that Stood is a delightful new story that uses fun music and humor to teach children how to make good choices in life. Story Line: When the Three Little Pigs roll into town looking to build some new houses, they meet one builder with a plan and two without a clue! Larry builds with hay, Mr. Lunt builds with bricks, but only Bob builds his houses on a firm foundation- following the wise plans from the "Master Builder's Handbook!" Will they choose the right builder that will keep their houses - and their lives - on solid ground? Find out in this pig's tale that shows kids that when we follow God's blueprints, we can make the right choices! PLUS: Ever wonder what happened before Humpty cracked? Find out in the very Veggie retelling of the classic Humpty Dumpty story in "The Good Egg of Gooseville". Bible Verses: Luke 10:27 and Matthew 7:24BUY IT: When you purchase the DVD at Walmart you get a FREE 24 pc puzzle with purchase! You also get a digital copy when you purchase from Walmart through VUDU so you can watch the DVD on the go! Plus CLICK HERE to print off your $3 coupon. You can also purchase directly from the website HERE! 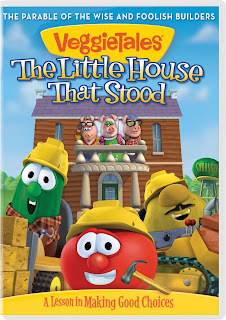 How would you like to add this great VeggieTales DVD to your families collection? Then all you need to do is simply fill out the form below. This giveaway is Open to the US Only!! I would like to win this for my little grandson! I love Veggie Tales and would love to win it for my family! I would like to win this for my son and to show at our children's church parties. I would like to win it for both my granddaughter and grandson. I would love this for my dd! I'd like to win for my niece. I'd like to give this to my youngest daughter. For my youngest kids 6,4,2.